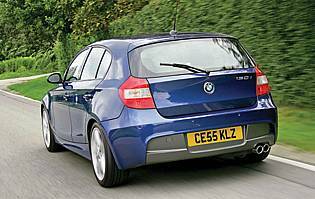 Arguably the most desirable small car in its class, the BMW 1-Series offers buyers the combination of rear-wheel drive handling and a premium badge in a small package. 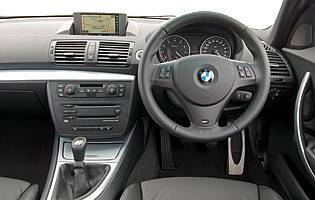 A high performance version is available in the form of the 130i, with the M-Sport package adding to the car's sporting credentials. In the transformation from regular 1-Series to the performance oriented M-Sport version, the 130i has gained significant appeal. 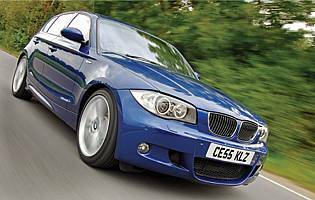 In lesser forms the 1-Series can look a little ungainly, squeezing traditional BMW styling cues onto a car smaller than a 3-Series, but with the addition of deeper front and rear valances, larger alloy wheels and a lower ride height, the 130i M-Sport looks significantly tougher and cuts a dynamic profile on the road. 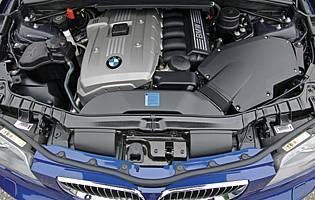 The 130i makes the most of BMW engine technology by using the lightweight six cylinder unit put to good effect in much larger cars, so in the smaller 1-Series shell it represents a significant increase in performance. With a six-speed gearbox and rear-wheel drive, it has the credentials to be an excellent sporting drive, making the most of its excellent weight distribution and the flexibility of the 3.0-litre engine. To match the engine changes, the M-Sport 130i benefits from lowered and stiffened suspension, combined with the larger 18-inch alloy wheels means impressive levels of grip and handling, helped by the weight distribution and drivetrain layout. A further feature is DSC+, an advanced version of DSC, which incorporates a large number of safety features. As well as controlling wheelspin and correcting a loss of grip, DSC+ provides a hill start facility, dries the brakes in wet weather, primes the brakes for full power in the event that the driver lifts from the accelerator suddenly, and also smoothes braking by releasing a small degree of pressure at the last second. In cold terms the 130i M-Sport may seem like an expensive option, but the reality is that to drive and to own it is highly pleasurable. The character, build quality and overall finesse adds to its desirability, while its unique mechanical layout gives it an advantage of its rivals.